BlitzWolf BWBS6 2 in 1 bluetooth 3.0 Extendable Folding Monopod Selfie Stick NEW. bluetooth Selfie Stick Tripod with Remote For iphone 6 6s 7 plus Android Samsung Galaxy S7 S8 Plus Edge BlitzWolf 3 in 1 Mini Pocket Extendable Monopod bluetooth 3.0 Aluminum Alloy 360 Degree Rotation. The Alumina ABS PC Material gives the selfie stick strong resistance to fall and capacity of anti-corrosion. 1 BW-BS6 Extendable Bluetooth Selfie Stick. Received Distance ≤10m. Portable Bluetooth Remote. BlitzWolf 4 in 1 Extendable Bluetooth Tripod Selfie Sticks For Sport Camera US. Condition is Used. Some scratches on bottom from use but does not affect integrity of the device. The blue tooth remote is rechargable. Does not come with wire to recharge its a micro USB. It works perfectly just don't need it. It holds most phones mine Is a s9 note and it fits. It you have a large or thick phone case you might need to take the phone out of the case.. Sold as is. Please see all pics for details and quality from smoke free home. Thank you. The head of the selfie stick can rotate a full 360 degrees for capturing the perfect shot. The clamp can also be rotate up to 203 degrees. 1 BW-BS3 Sports Selfie Stick. Built with aluminum alloy and rubber, the BS3 is lightweight and holds steady in your hands. 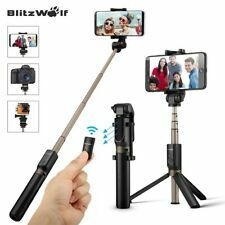 BlitzWolf 3 in 1 Bluetooth Selfie Stick Wireless Mini Tripod Monopod Extendable Selfie Stick Universa For Samsungl For iPhone 7. More than your usual selfie stick, the BS3 is a versatile mini tripod, table top tripod and selfie stick. You can use the selfie stick when taking self-portraits in handle mode, recording videos and making a live show in tripod mode. 1 Blitzwolf BW-BS8 Extendable bluetooth Tripod Selfie Stick With LED Fill Light. Bluetooth Selfie Stick Tripod with Remote For iphone 6 6s 7 plus Android Samsung Galaxy S7 S8 Plus Edge BlitzWolf 3 in 1 Mini Pocket Extendable Monopod bluetooth 3.0 Aluminum Alloy 360 Degree Rotation. The head of the selfie stick can rotate a full 360 degrees for capturing the perfect shot. The clamp can also be rotate up to 203 degrees. 1 BW-BS3 Sport Selfie Stick. Built with aluminum alloy and rubber, the BS3 is lightweight and holds steady in your hands. 1 BlitzWolf® BW-BS0 Selfie Stick Monopod. Flexible Rod Locking Structure Multi-angle Mount Head. Stick Length: 712mm MAX. Detail Image. Weight (g): 161.4g. Color: Black. Certification: CE, FCC, BQB, RoHS. What’s so great about BlitzWolf selfie sticks?. Drive-by-wire selfie Stick. Perfect for traveling, video diaries, video blogging, hiking/camping, weddings, parties, concerts, sporting events and daily selfie photography. The Alumina ABS PC Material gives the selfie stick strong resistance to fall and capacity of anti-corrosion. 1 BW-BS6 Extendable Bluetooth Selfie Stick. Compatible OS iOS 5.0 above, Android 4.3 above. More than your usual selfie stick, the BS3 is a versatile mini tripod, table top tripod and selfie stick. The head of the selfie stick can rotate a full 360 degrees for capturing the perfect shot. 1 BW-BS3 Bluetooth Selfie Stick.